'Black holes have moved from science fiction to science fact' say Southampton astrophysicists. The sight of the first images ever taken of a black hole have been described as a ‘watershed moment in the history of science’ by leading astrophysicists from the University of Southampton. Although neither were part of the team to present the photographs taken of the black hole some 500 million trillion kilometres from Earth, Associate Professor Poshak Gandhi from Southampton’s Astronomy Group and Professor of Applied Mathematics, Nils Andersson, spoke of the significance and history made by the discovery. “Seeing is believing, and this is, by far, the most direct proof that black holes exist,” said Dr Gandhi who researches extreme time-domain astrophysics with an emphasis on multiwavelength observations of black holes. “We are celebrating 100 years since the bending of light was verified during a total Solar eclipse in 1919 by a team led by Sir Arthur Eddington. A century later, we can now witness light being bent around a black hole. “Black holes have moved from science fiction to science fact,” enthused Professor Andersson, an expert in relativistic astrosphysics particularly related to the dynamics of black holes and neutron stars. 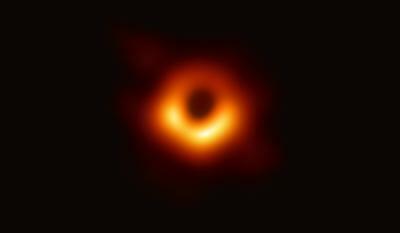 “The astonishing image of the behemoth black hole at the centre of the M87 galaxy released by the Event Horizon Telescope team – the result of an intense international collaboration making use of high precision radio interferometry – refines the argument. Adding to the LIGO detections of gravitational waves from merging black holes, the Event Horizon Telescope data has taken us to the point where it is difficult to find alternative explanations. “Does this mean that we have finally “seen” a black hole? Not exactly,” Professor Andersson continued. “The Event Horizon image shows the presence of what is colloquially known as the light ring (technically, the unstable photon orbit), which is located outside a black hole. We are not seeing the event horizon itself. Still, this means that we are exploring a region much closer to a black hole than ever before. For example, the gas observed whirling around the centre of M87 by the Hubble space telescope (some of the previous “best” evidence for the presence of a black hole) was much further away. Similarly, the stars seen moving around our own galactic centre (also suggesting the presence of a massive black hole) would be at a distance thousands of times larger. This is hugely important. The Event Horizon Telescope results lead to a very precise measurement of the black hole mass. The black hole ‘photographed’ by an international team of scientists was viewed by a network of eight telescopes comprising the Event Horizon Telescope Array around the world. This particular black hole measures some 40 billion KM across – three million times the size of Earth – and its revelation via these unique images have now enthused Dr Gandhi to become even more excited about further study of this still-mysterious phenomenon. While Professor Andersson also remains optimistic of further breakthroughs to come, he suggests that these may not be so visual in the short term. “The Event Horizon Telescope observations rely on the fact that the black hole in M87 is an absolute giant (weighing 6 billion times as much as the Sun) and it is relatively close to us,” Professor Andersson explained. “Other galaxies host black holes but these are unlikely to be resolved with the same detail. The one exception, and the team’s natural next target, is our own galaxy’s black hole (in Sagittarius A*). This is closer to home, obviously, but the black hole is more than a thousand times smaller than the one in M87 and the galactic centre is a messy region of space. These observations will be a challenge.